While the number of applications suitable for early generation variable frequency drives was limited based on the horsepower of the motor, today's variable frequency drives can be installed in practically any HVAC application found in commercial and institutional buildings. Systems can be operated at higher voltages than those used by earlier generations, resulting in off the shelf systems for motors up to 500 horsepower. Another problem that has been corrected by today's systems is operational noise. As the output frequency of the variable frequency drives decreased in response to the load, vibrations induced in the motor laminations generated noise that was easily transmitted through the motor mounts to the building interior. Today's variable frequency drives operate at higher frequencies, resulting in the associated noise being above the audible range. And AC drives continue to evolve. From numerous system benefits to an increasing range of available applications, AC drives are proving to be ever more useful and powerful. Most conventional building HVAC applications are designed to operate fans and pumps at a constant speed. Building loads, however, are anything but constant. In a conventional system, some form of mechanical throttling can be used to reduce water or air flow in the system. The drive motor, however, continues to operate at full speed, using nearly the same amount of energy regardless of the heating or cooling load on the system. While mechanical throttling can provide a good level of control, it is not very efficient. AC drives offer an effective and efficient alternative. Operating at less than full load. Building systems are sized for peak load conditions. In typical applications, peak load conditions occur between 1 and 5 percent of the annual operating hours. This means that pump and fan motors are using more energy than necessary 95 to 99 percent of their operating hours. Oversized system designs. Designing for peak load oversizes the system for most operating hours. This condition is further compounded by the practice of oversizing the system design to allow for underestimated and unexpected loads as well as future loads that might result from changes in how the building space is used. Motor energy use is a function of speed. The most commonly used motor in building HVAC systems is the induction motor. With induction motors, the power drawn by the motor varies with the cube of the motor's speed. This means that if the motor can be slowed by 25 percent of its normal operating speed, its energy use is reduced by nearly 60 percent. At a 50 percent reduction in speed, energy use is reduced by nearly 90 percent. The installation of an AC drive in an HVAC application addresses the inefficiencies introduced by the first two factors, while producing the energy savings made possible by the third. The AC drive accomplishes this by converting 60 cycle line current to direct current, then to an output that varies in voltage and frequency based on the load placed on the system. As the system load decreases, the AC drive's controller reduces the motor's operating speed so that the flow rate through the system meets but does not exceed the load requirements. The basic benefit to using an AC drive is energy savings. By matching HVAC system capacity to the actual load throughout the entire year, major savings in system motor energy use are achieved. In contrast, when a motor connected to an AC drive is started, the AC drive applies a very low frequency and low voltage to the motor. Both are gradually ramped up at a controlled rate to normal operating conditions, extending motor life. 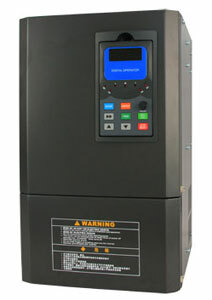 AC drives also provide more precise levels of control of applications. For example, high-rise buildings use a booster pump system on the domestic water supply to maintain adequate water pressure at all levels within the building. Conventional pump controls in this type of application can maintain the pressure within a certain range, but an AC drive-based system can maintain more precise control over a wider range of flow rates, while reducing energy requirements and pump wear. The most commonly used motor in building HVAC applications is the three-phase, induction motor, although some smaller applications may use a single-phase induction motor. AC drives can be applied to both. While AC drive controllers can be used with a range of applications, the ones that will produce the most significant benefits are those that require variable speed operation. For example, the flow rate produced by pumps serving building HVAC systems can be matched to the building load by using an AC drive to vary the flow rate. Similarly, in systems that require a constant pressure be maintained regardless of the flow rate, such as in domestic hot and cold water systems, an AC drive controlled by a pressure setpoint can maintain the pressure over most demand levels. The majority of commercial and institutional HVAC systems use variable volume fan systems to distribute conditioned air. Most are controlled by a system of variable inlet vanes in the fan system and variable air volume boxes. As the load on the system decreases, the variable air volume boxes close down, increasing the static pressure in the system. The fan's controller senses this increase and closes down its inlet vanes. While using this type of control system will reduce system fan energy requirements, it is not as efficient or as accurate as an AC drive-based system. Another candidate for AC drive use is a variable refrigerant flow systems. Variable refrigerant flow systems connect one or more compressors to a common refrigerant supply system that feeds multiple evaporators. By piping refrigerant instead of using air ducts, the distribution energy requirements are greatly reduced. Because the load on the compressor is constantly changing based on the demand from the evaporators, an AC drive can be used to control the operating speed of the compressor to match the load, reducing energy requirements under part-load conditions. While the primary benefit of both of these AC drive applications is energy savings, AC drives are well suited for use in other applications where energy conservation is of secondary importance. For example, AC drives can provide precise speed or torque control in some commercial applications. Some specialized applications use dual fans or pumps. AC drives, with their precise speed control, can ensure that the two units are operated at the desired speed and do not end up fighting each other or having one unit carry more than its design load level. One of the most significant changes that has taken place recently is that with the widespread acceptance of the units and the recognition of the energy and maintenance benefits, manufacturers are including AC drive controls as part of their system in a number of applications. For example, manufacturers of centrifugal chillers offer AC drive controls as an option on a number of their units. Similarly, manufacturers of domestic water booster pump systems also offer the controls as part of their system, providing users with better control strategies while reducing energy and maintenance costs. When evaluating the installation of an AC drive, facility executives should take into consideration a number of factors related to the specifics of the application. For example, most AC drives emit a series of pulses that are rapidly switched. These pulses can be reflected back from the motor terminals into the cable that connects the AC drive to the motor. In applications where there is a long run between the motor and the AC drive, these reflected pulses can produce voltages that exceed the line voltage, causing stresses in the cable and motor windings that could lead to insulation failure. While this effect is not very significant in motors that operate at 230 volts or less, it is a concern for those that operate at 480 volts or higher. For those applications, minimize the distance between the AC drive and the motor, use cabling specifically designed for use with AC drives, and consider installing a filter specifically designed to reduce the impact of the reflected pulses. Another factor to consider is the impact the AC drive may have on the motor's bearings. The pulses produced by the AC drive can generate a voltage differential between the motor shaft and its casing. If this voltage is high enough, it can generate sparks in the bearings that erode their surfaces. This condition can also be avoided by using a cable designed specifically for use with AC drives.